Losing a permanent tooth is like losing a lifelong friend—you can fill the space, but nothing truly compares to the original. Nevertheless, when you’ve lost one or more teeth, replacing them with a bridge or partial denture is vital to your smile’s wellbeing. A dental bridge can literally bridge the gap left in your smile by one or several missing teeth in a row. But if your lost teeth aren’t adjacent to each other, then your dentist may recommend a partial denture, which fits around remaining teeth to fill in the gaps between them. A dental bridge is constructed as a single piece with supportive dental crowns on either side. The crowns are bonded to the remaining teeth adjacent to the gap, called abutment teeth, and serve to stabilize the bridge. Dental bridges are often the best option for patients who’ve lost a single tooth, or who’ve lost two or three teeth in a row. Unfortunately, a dental bridge can’t replace multiple lost teeth that are not nearby each other. A complete denture consists of an entire row of replacement teeth that sit on top of a gum-colored plastic base. A partial denture is designed to follow your dental ridge like a complete denture, but only contains replacement teeth where needed. Using a system of hidden clasps, a partial denture can complete your smile even if your tooth loss pattern seems sporadic. Dental implants are surgically inserted to your jawbone to support your appropriate dental prosthesis. If your jawbone is strong enough to support them, then your dentist may recommend replacing your lost teeth with implants, or upgrading your current dental bridge or denture with one or more of the titanium root devices. 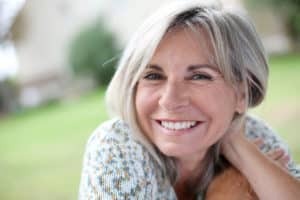 Dental implants mimic the roots that support your natural teeth, and offer unmatched stability for your replacements as well as improved function and comfort.